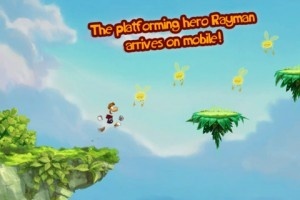 Rayman Jungle Run is a breath of a fresh air. Instead of fighting against the limitations of the iOS platform and floundering, Ubisoft and developer Pasta Games scale back complexity to deliver a big-brand experience that finally feels at home on mobile. Who better to show that less is more than a guy with no arms or legs? On the heels of last year’s Rayman Origins on consoles, this title transports players to a universe cut from the same colorful cloth. The mission there is simple: rescue the iridescent, orb-like “Lums.” Across 40 levels, players will run, jump, spin, and fight through intricate mazes of baddies and obstacles...all with the touch of a button. The catch? Rayman can’t stop running. The game’s four zones are themed around the use of a classic move from his roster. Every level is a carefully crafted cacophony of trampolines, bottomless pits, hotly pursuing projectiles, and pesky enemies - to name just a few. So while controls may be limited to expertly timed jumps, making it to the finish flag manages to feel wonderfully like a high-flying series of acrobatics. Moreover, crucial to a perfect score are medallions hidden in hard-to-reach areas of each level, and nabbing them often means anticipating the contours of the course at a breakneck pace. The result is a game that feels all at once like a tough-as-nails platformer, and a puzzler on speed. Rayman Jungle Run is resplendent. Using the dynamic UbiArt system that debuted with Rayman Origins, the game is a seamless blend of styles ranging from the painterly to the surreal, with hand crafted flare oozing from every pore. Also returning are some of Rayman Origins’ virulently catchy tunes, assembled from hints of blue grass, country, tribal dance, and pop. The only real sticking point is the game’s less than robust replay value. Certainly, unlocking each world’s sadistically hard bonus level or trying to set a new speed record will have players feverishly pressing the replay button seeking perfection. 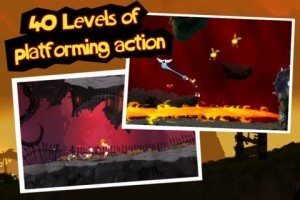 In the long run, however, a true endless mode generated procedurally from the game’s many levels would have been an even meatier hook back into the land of the Lums. Who am I kidding, though? I’m just pining because Rayman Jungle Run is a game that has me wanting more as soon as I'm finished. Not only is it a huge departure from Ubisoft’s gaggle of barely passable licensed fare, but it arguably sets the bar for how to go from console to mobile. No arms. No legs. No flaws.